Wilshire at Lakewood Care Center - CHM | Capital Health Management, Inc.
Wilshire at Lakewood Care Center is a certified, privately owned care center that has offered residents optimal care since 1999. The community offers both long-term skilled nursing and short-term skilled nursing services, rehabilitation services and highly specialized wound care services. Recently, our Medicare A / Managed Care Hall was updated to offer all private rooms with flat screen televisions, WiFi and in-room dining options. Wilshire at Lakewood Care Center offers a warm and welcoming atmosphere for residents and their loved ones in order to help them achieve the highest level of physical and mental well-being possible. Wilshire at Lakewood Care Center is located at 600 NE Meadowview Drive in Lee’s Summit, Missouri 64064. 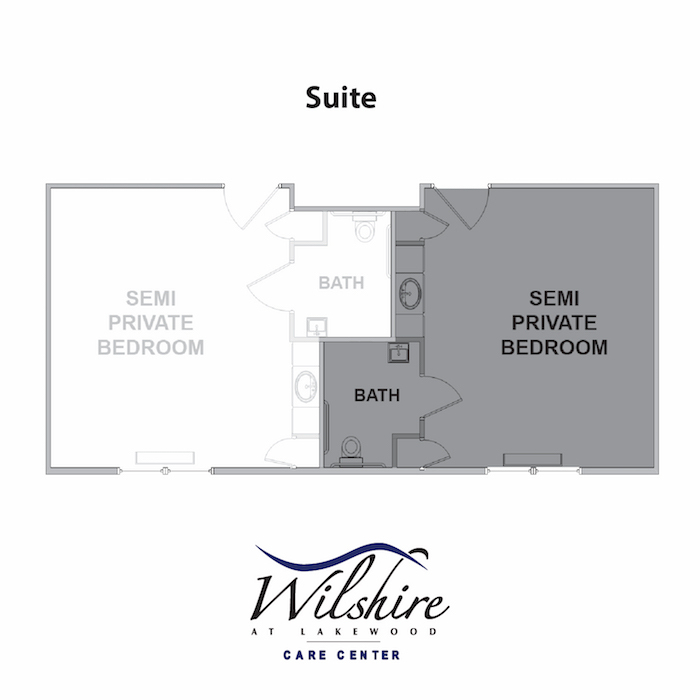 To get into contact with Wilshire at Lakewood Care Center or to schedule a tour, call 816.554.9866. To send medical records or any other requested information, please fax to 816.554.9867. Click here to read a letter sent in from a resident’s family member detailing the supportive, healing care they experienced with Wilshire at Lakewood Care Center! Wilshire at Lakewood Care Center offers two types of comfortable room styles with a variety of amenities such as daily housekeeping, personal laundry services, personal care services, cable services and more. We are mindful that moving to a new place may not always be easy. For this reason, we are proud to serve our residents with a full-time admissions coordinator and transitional care nurse. These individuals visit with discharge planners, case managers, individuals and family members who are considering either a short term stay or a long term stay at Wilshire at Lakewood Care Center. Social activities are a high priority at Wilshire at Lakewood Care Center. We believe that social activities lead to a thriving community, where people can support and motivate each other. We provide daily activities such as musical performances, arts and crafts, movies, exercise classes and much more. Wilshire at Lakewood Care Center even has a pond and a resident-maintained garden that allow residents to spend peaceful time outside in nature. Wilshire at Lakewood Care Center offers a wide array of diet-sensitive, yet delicious meal options each day. A continental breakfast is offered every morning as well as a hot meal option. Several entrée choices are served for lunch and dinner in addition to soups, salads and desserts. All diets are designed and monitored to meet the unique nutritional and dietary needs of each resident, under the supervision of our Consulting Dietician. Whether you are insured by Medicare, Medicaid, private pay or another insurance source, Wilshire at Lakewood Care Center is ready to help you determine your coverage. Wilshire at Lakewood Care Center offers a wide range of services to our residents to ensure maximum comfort and speedy recoveries. “Wilshire’s staff are nice, friendly, cheerful and willing to help out with just about anything. The ambiance is really good. The seasonal decorations keep things fresh. In my opinion, Wilshire is top of the line and an outstanding place. My wife and I scouted all the facilities in Lee’s Summit and this one was the best”. "Living here has improved my quality of life because of the caring staff that takes such good care of me!" "My favorite parts about living here are the activities and the staff." "This community has helped improve my quality of life by meeting my health, household and personal needs." "My favorite parts about living here are the good, caring people." "I could go on and on about how great an experience and care Wilshire provided to my mother and me. These people made a huge difference in my mother's life. You all are the best!"